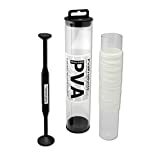 8 metres of wide PVA Mesh on a tube nicely housed inside a lightweight, resalable, water and shock proof storage tube. We only use clear tubes for our mesh so that you can clearly see how much bait you are loading up with. Also included in this great deal is a double ended plunger. Our mesh measures approximately 36mm in diameter but will comfortably fit onto any tube measuring between 32-40mm. This size makes it ideal for either pellets or boilies.